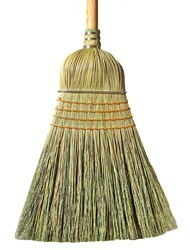 PRODUCT: WAREHOUSE CORN BROOM, HEAVY DUTY, 4-ROWS OF STICHING PLUS METAL BAND, WOOD HANDLE. PRICE/EACH. FEATURES: Designed for rugged indoor/outdoor cleaning. 100% natural broom corn fibers for long life and effective pick up. Remove fine dirt from even or rough surfaces. Heavy-duty, 1-1/8" dia. lacquered pine handles.